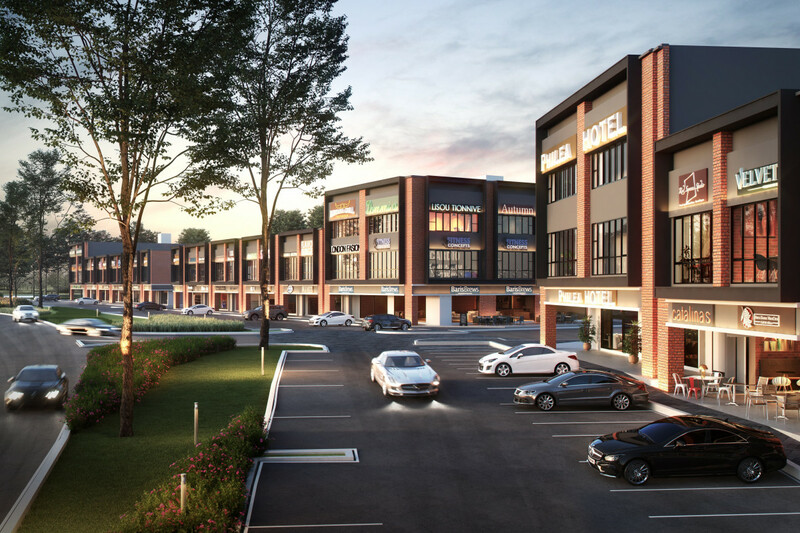 SEMENYIH (March 20): Property developer S P Setia Bhd is set to launch the first phase of its township inspired by resort-living, called Setia Mayuri this Saturday, March 23. Located off Jalan Broga in Semenyih, Selangor, the 209-acre township has a gross development value (GDV) of RM700 million. The first phase will comprise 32 units of 2- to 3-storey shop offices called Baris [email protected] Mayuri with a GDV of RM40 million. The intermediate units are 20 ft by 80 ft with built-ups from 3,200 sq ft, while the corner lot sizes are 80 ft by 80 ft with built-ups from 14,000 sq ft. About 40% of the units have been reserved since they were opened for bookings to business associates in early March, said Setia Ecohill general manager Koh Sooi Meng. “The shop offices are actually road-fronting and have high visibility and accessibility from Jalan Broga. Just 500m away is the University of Nottingham which has a student population of 5,000 and growing,” he told EdgeProp.my. Coming up next to Setia Mayuri is a 700-unit condominium by another developer which will add to the traffic. “We reckon businesses such as fast-food chains, restaurants, laundry operators, budget hotels and mini-marts will surely do well in the area,” said Koh, adding that these will be the only shop offices in the entire township. Citing Ecohill Taipan shop offices in Setia Ecohill which is a ten-minute drive from Setia Mayuri, Koh expects the Baris Place shop offices to see similar good occupancy one year after handover. Prices for the intermediate units at Baris Place start from RM1.03 million while the corner units are going for RM3.87 million. When it comes to leasing, S P Setia helps its customers with getting tenants, said Koh. Meanwhile, Setia Mayuri’s first residential phase will be launched in May and will comprise 46 semidee homes and 18 bungalows. Built-ups for the semidees start from 2,500 sq ft onwards, while built-ups for the bungalows start from 3,000 sq ft. Koh said one of its unique selling points is that each unit’s land size is different and the land size offered is bigger than the usual semidees and bungalows. The semidees have a minimum land size of 4,000 sq ft (50 ft by 80 ft) priced from RM800,000 while the bungalows’ are from 54 ft by 118 ft with prices expected to start from RM1.3 million onwards..
“The units are individually titled and freehold so if the owners want to renovate later on, they can. In total, our township will consist of only 136 bungalows and 318 semi-dees. There will also be a 4.77 acre Balinese garden in the township,” Koh said. “Inspired by the traditional Balinese village, We hope residents will feel like they are returning to their holiday home every day in line with our tagline ‘Your Everyday Holiday Home‘. We put in a lot of thought in the conceptualisation of the project based on the location of the site. Not far from here is a road leading to Broga Hill. As you know, Semenyih is popular for its ecotourism and a lot of people come here for hiking and enjoy the serenity of this area. So, we thought why not go for the resort living concept here?” he elaborated. The Setia team even went to Bali to learn about the culture and concept of the Balinese home and lifestyle. They then imported a few structures from Bali to be rebuilt and showcased at its sales gallery when it is fully completed by May. The name Mayuri was inspired by the ancient Sanskrit word “Mayur” which means peacock which denotes nobility and being outstanding. The peacock also prefers living in a peaceful environment, something which the developer hopes residents can enjoy here. “We also used the cul-de-sac layout so that there is better control of traffic in the residential area to create a safer environment, especially for the elderly and young children. The residents in Setia Mayuri can also utilise the clubhouse facilities at Club 360 at Setia Ecohill,”he said. Setia Mayuri is accessible via Jalan Broga, LEKAS, SILK Highway and the North-South Expressway. The development will also benefit from the upcoming East Klang Valley Expressway (EKVE) which will connect Ukay Perdana in Ampang, Selangor and Bandar Sungai Long, Kajang.